It’s the most wonderful time of the year – the time for holiday bakers and cookie monsters to unite! So what’s a quality improvement professional to do when his favorite sugar cookie recipe produced cookies that failed to hold their festive holiday shapes after being baked? Run a Design of Experiment (DOE), of course! 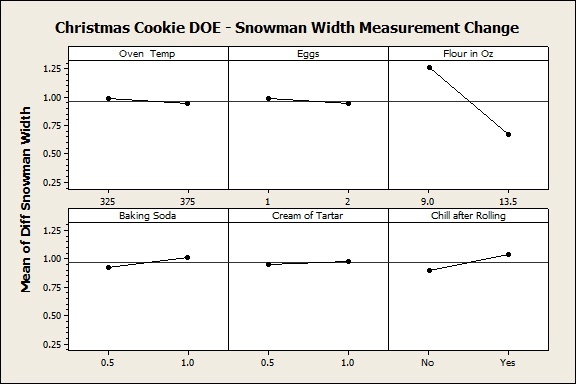 Bill Howell, an avid baker and quality professional, used Minitab’s DOE tools to get to the bottom of his sugar cookie shape faux pas. Howell planned to design an experiment that would allow him to screen many factors, determine which were most important, then adjust his process to get the results he wanted—in this case, to make cookies that still looked like snowmen when they came out of the oven. He elected to run a fractional factorial experiment, a class of factorial designs that lets you identify the most important factors in a process quickly and inexpensively. Howell took extensive steps to ensure a robust process. He used 3 different shape cutters to prepare the cookie dough for the oven, selecting measuring points on each cutter, and measuring them with a 6 inch caliper accurate to .001 inch. 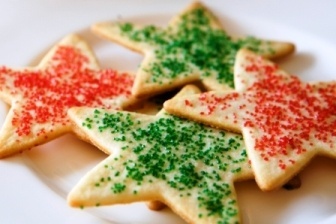 Each of the eight experimental batches included stars, snowmen and gingerbread men. To ensure consistent dough thickness, Howell used wood strips to prevent his rolling pin from flattening dough any thinner than ¼ inch. To minimize undue influence or unintentional bias during the baking process, he randomized the placement of the cookies on the baking sheet. He also rotated the baking sheets 180° halfway through baking. Because two oven temperatures were used in the experiment, baking times varied by trial. The actual cooking times for each trial were recorded on the trial instruction sheet. Each trial consisted of baking two trays of cookies. When they came out of the oven, Howell measured two samples of each shape from both trays to see if there had been a change in overall height, a selected width measurement, or thickness. These dimensions were recorded on preprinted forms, which identified the trial number, data of trial, cutter shape, width and height. Howell calculated averages and standard deviations for each cutter shape, and used Minitab to analyze the data. Howell also used Minitab to create main effects plots, which examine differences among level means for one or more factors. 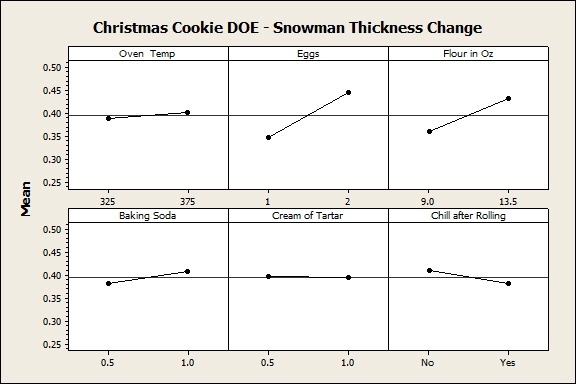 Howell’s recipe can be found at http://www.minitab.com/en-us/News/Sugar,-Spice,-and-Everything-Statistics--Using-Design-of-Experiments-to-Bake-a-Better-Cookie/. If you try the recipe, be sure to let us know how your cookies turn out. Happy Baking! Have you ever used DOE to optimize a recipe? Let us know in the comments below.